Northern R&D operates as an independent unit within Migal (Galilee scientific research institute). 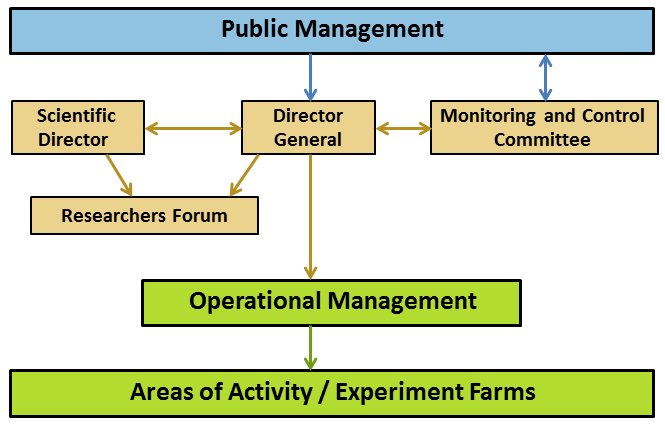 Northern R&D has a broad management structure including a representative of KKL-JNF as the chairman and representatives of government ministries – Agriculture, Negev and Galilee, and the unit for settlement – and also representatives of the Agricultural Research Organization and representatives of the municipal councils within which Northern R&D operates. The scientific director of Northern R&D is a senior researcher at the Volcani Center; he guides the activity and assists in promotion and thinking in the different fields. Northern R&D is active in 11 agricultural branches – mainly branches of plant crops, and a number of lateral activities. For each field there is an active staff with its own director. The staff guides the operations and is responsible for the precise execution of the research program. Northern R&D has a monitoring and control committee that constantly assesses progress in the research programs and their relevance to the needs of agriculture in the region.